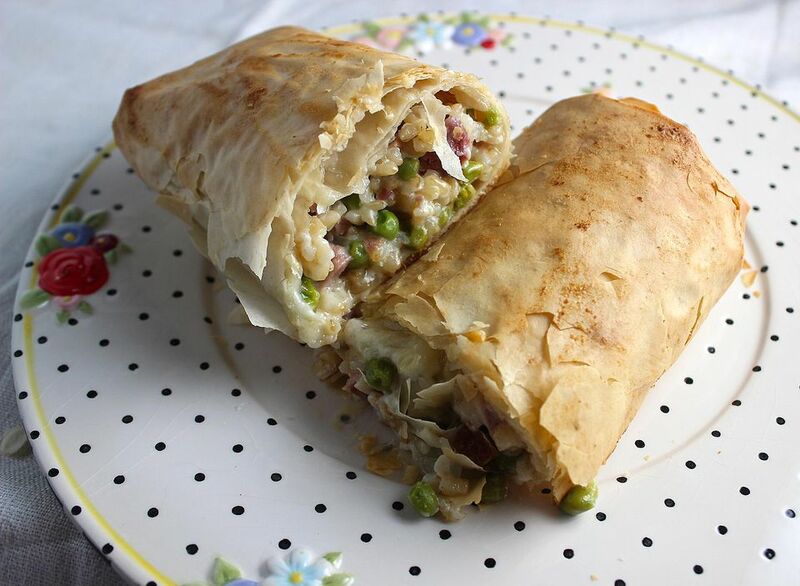 Filo dough is that wonderful tissue-paper thin pastry that is used in baklava and other fabulous dishes such as filo egg bake. Learn how to work with this exotic ingredient. First, thaw the filo dough carefully, following the package directions exactly. This is usually best done in the refrigerator overnight. When the dough is thawed, remove from the package, open the plastic bag, and unroll the dough. Remove the top layer of paper. Have plastic wrap and a damp (not wet) kitchen towel ready to cover the dough while you're working with it. Carefully pull one sheet of the dough off the stack. Don't worry if it tears - just keep it together, the best you can. Immediately cover remaining dough with plastic wrap and the damp towel. Place the filo sheet on a cookie sheet, and brush with melted butter, using a pastry brush or a spatula. Repeat process with another sheet of dough, covering the unused dough immediately. Continue according to the recipe - usually, you will layer 3 to 6 sheets of filo. Prepare the filling and place on the layers, roll up or fold, according to the recipe instructions, and brush the filled pastries with more butter. Bake as directed in the recipe, until the pastry is golden brown and flaky. Always, always cover the dough you aren't buttering and layering. If it dries out, it becomes brittle to the touch, and you'll never be able to work with it. Don't worry if the pastry tears. Just brush butter on it and layer on another sheet. Mini filo shells are a great way to use the dough for the first time. They're pre-formed; all you have to do is add the filling.